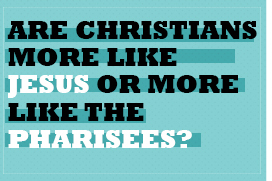 Call it an interlude if you must, but this survey by the Barna Group is worth a glance if it causes me to reflect on who others see in me; Jesus or Pharisee? By the time I had made it through the article I was pretty disgusted with my own attitudes and actions. As much as I didn’t want to admit it, it appears there’s a lot more Pharisee living in this heart than Kingdom living allows for. Here’s a sampling, and the entire article with some neat charts can be found here. I listen to others to learn their story before telling them about my faith. In recent years, I have influenced multiple people to consider following Christ. I regularly choose to have meals with people with very different faith or morals from me. I try to discover the needs of non-Christians rather than waiting for them to come to me. I am personally spending time with non-believers to help them follow Jesus. I find it hard to be friends with people who seem to constantly do the wrong things. It’s not my responsibility to help people who won’t help themselves. I feel grateful to be a Christian when I see other people’s failures and flaws. I believe we should stand against those who are opposed to Christian values. People who follow God’s rules are better than those who do not. Picking apart the second bulleted statement from the self-righteous attitudes list, isn’t it the Christian’s responsibility to always be helping people who won’t help themselves? Isn’t this the message at the heart of the gospel? While I was faithfully serving my sin master, God sent His Son to help me, because I had no intention of helping myself (Romans 5:8). So if you found the time to visit Barna and read their article, what did you think? Can you find a biblical basis for each of their bulleted lists? If so, who do you see in the mirror; Jesus or Pharisee? This entry was posted in Christians at Work, Discipleship, WordPosts and tagged Barna Group, being like Jesus, Christianity, Pharisee. Bookmark the permalink. Statistics can be presented to indicate anything, but the FACT is that we (blood-bought, adopted children of the living God) do NOT live up to the standard we should. We do NOT reflect the love, mercy and grace of Christ to others to the extent we should. We admit it . . . but we need to DO something about it! After reading this post I went to the Barna site to read the survey and find the questions. I am not happy with me after reading the post and article and need to make some changes. This is really worth the read. They will know we are Christians by our Love…It is the kindness of God that leads to repentance. Nothing disarms the world more than a display of grace and mercy. God never needed us to defend His gospel, but He does need us to be His hands and feet. Because we have a need for people to be punished for wrong doing, we project that onto God. God did not come to punish sinners. He came to seek and save that which was lost. Let’s save the judgment for judgment day and instead be a true reflection of our King. He will hold those accountable that need to be held accountable on that day. Not once do I read where He asked me to do that. God has many of us on a journey to examine the hard-line things we were taught. If we ask Him, He will reveal His heart on the matter. We just have to remain teachable. Great Post Mike! Very well said! God doesn’t need us to defend His gospel… instead He commands all to repent and believe it. Sometimes I think we forget that the gospel is good news. Thanks for a great response. Wow..I can’t really say anything different here than what has been said. What an awesome post! God bless you and thank you! While I’m not a fanatic of these statistics, this one surely presents some thought provoking points. Thanks Lyn, and many blessings to you! It seems that this raises interesting questions and requires us to look at ourselves, but it also seems as if the study is slanted in order to fit what their own idea of a Christian is and not entirely what Jesus Himself, the apostles and other writers of the Bible tell us what a follower of Christ should be. It seems as if these surveyors think that all followers of Christ should spend more time in the world instead of in Christ! God bless and it is an interesting look at Christians! Yes, you make a very valid point good friend. There has to be a certain level of balance when weighing any evidence because the message of the cross is indeed offensive. Still… I can see where there are many of these bulleted points that align perfectly with Scripture and even with the life of Jesus as He walked the earth… that I fail miserably at shadowing. Thanks and many blessings to you today! The image of God in all of us is obscured by sin, else we should not have needed redeeming; but it is humbling to do the quiz and see just how obscured. And very good thoughts, in which there is a great deal. If we do not bear witness, how can we have the effect we should have? these words also convict me and I am blessed by them, thanks for sharing! It’s a pretty effective self-examining tool. Pursuing a small study on this topic, we’ve also begun the reading of “Un-Christian” by David Kinnaman. Thanks and blessings good friend. thanks for the head up on the book….I”m going to get it!